We meet on the 1st and 3rd Wednesdays of each month, excluding December, at the Covenant Presbyterian Church, 550 Madison Avenue (corner of Madison & Olive), Scranton, PA. The meetings start at 7:30 pm however, our members arrive anywhere between 7:00 pm and 7:30 pm for discussion, trading, etc. You may either stop in to visit and introduce yourself at our meetings or contact one of our officers. Dues are $10 per year. We welcome all those that want to discuss and share the joys of philately. The first meeting of the month consists of our business meeting followed by a presentation or program. The program can be anything from a presentation given by one of our members or a guest, a film or documentary, a mixture sale, or a nice little "exhibition night" where all members create a one page exhibit. The second meeting of the month usually consists of an auction with lots provided by the members, which takes place after our business meeting. We do try to make it to the shows within a driving distance of the Scranton/Wilkes-Barre area. We normally attend the ASDA Shows in New York City, PNSE (PA Natl. Stamp Exhibition) in King of Prussia, Lancopex in Lancaster, NOJEX in New Jersey, and New Jersey Garden State Stamp Show in Totowa, NJ (formerly in Wayne, NJ). We make a trip in the summer/fall to the APS (American Philatelic Society) where our members can go through the circuit sales books or use the APRL (American Philatelic Library). December is our Christmas Dinner. We do not hold any meetings during this month, but have fun at the dinner to reflect upon what a great year we have had. 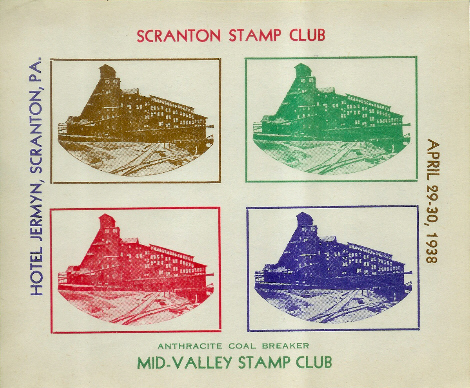 The Scranton Stamp Club was founded on a spring evening in 1949 at the Chamber of Commerce building in Scranton, Pennsylvania. It is officially known as the Northeast Pennsylvania Philatelic Society (NEPPS) and is governed by four officers that oversee the club's business & functions, as well as providing the proper atmosphere for collectors to enjoy and prosper in the hobby. The stamp club actually started long before that March 9th meeting in 1949. There was in existence a group of collectors who were known as the Scranton Stamp Club and held irregular meetings. It lacked formal recognition in the prevailing stamp community and failed with time due to a lack of leadership. The newsletter "NEWS-PEPS" was sent to each member's home once a month. Shortly thereafter, the name of the letter was changed to NEPPS-PEPS, more to illustrate the society. Somewhere in the club's history the letter again change to Stamping Around. This was around 1983. The newsletter was discontinued for a number of years, to make a return in August, 2006 under the name of NEPPS Philatelic Inquirer. The current newsletter is still following the monthly format which is mailed to the member's homes.